After Antarktis, this is the second part of the radio broadcast of the concert at Berlin on August 1st, 1987. The sound quality is nearly as high as on the Antarktis CD. Unlike that bootleg, the track listing features the real names of the compositions. The cover is a night photography of the Reichstag building; the back cover shows Edgar Froese among his equipment during the concert. The CD itself is titled 20th Century Heroes and alleged to be 'For promotional use only'. It does not mention Tangerine Dream, but instead the TD logo that originally appeared on Tyger for the first time is printed onto the CD in black and gold colour. The text on the backside insert refers to an alleged danish music label called 'Nordiska Musiken' and an alleged German company called 'Sphärenklänge Verlag'; the origin of this CD was Germany. The only official release of this concert was a remixed excerpt of 27 minutes on the album Livemiles. Besides this material the bootleg contains live versions of material from the records Flashpoint (1984), Le Parc (1985), Underwater Sunlight (1986), Tyger and A Time For Heroes (both 1987). 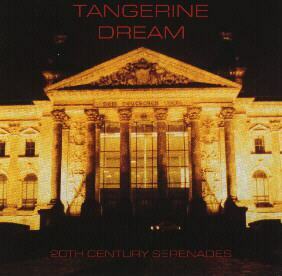 This bootleg became obsolete due to the release of Tangerine Tree Volume 38: Berlin 1987.